This Lamp Features A Hand Woven Rattan Oval Sphere, Displayed On A Tall Tapered Base Finished In An Aged Coffee Stain, With Faux Wood Grain Texture. The Round Hardback Drum Shade Is A Khaki Linen Fabric. The Table Lamps Collbran Woven Rattan Lamp by Uttermost at Howell Furniture in the Beaumont, Port Arthur, Lake Charles, Texas, Louisiana area. Product availability may vary. Contact us for the most current availability on this product. 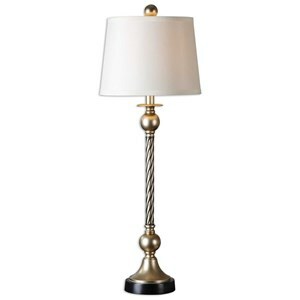 Browse other items in the Table Lamps collection from Howell Furniture in the Beaumont, Port Arthur, Lake Charles, Texas, Louisiana area.